Barcelona’s Primavera Sound festival returns from June 1-5, and as always, the lineup is pretty amazing. 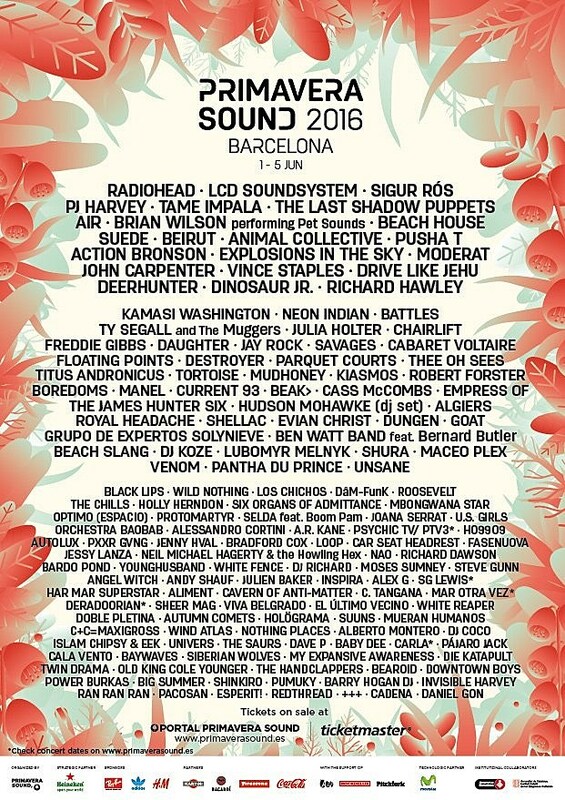 They’ve got Radiohead, LCD Soundsystem, Sigur Ros, PJ Harvey, Tame Impala, The Last Shadow Puppets, Air, Brian Wilson (performing Pet Sounds), Beach House, Suede, Beirut, Animal Collective, Pusha T, Action Bronson, Explosions in the Sky, Moderat, John Carpenter, Vince Staples, Drive Like Jehu, Deerhunter, Dinosaur Jr, Richard Hawley, Kamasi Washington, Neon Indian, Battles, Ty Segall, Julia Holter, Destroyer, Thee Oh Sees, Titus Andronicus, Tortoise, Mudhoney, Boredoms, Royal Headache, Shellac, Dungen, Beach Slang, Venom, Unsane, The Chills, Holly Herndon, Psychic TV, Mbongwana Star, U.S. Girls, Protomartyr, Julien Baker, Sheer Mag, Downtown Boys and still so much more. Tickets are on sale now. Full lineup below. Radiohead, who haven’t played live since 2012, were also announced to headline Portugal’s Nos Alive and Switzerland’s OpenAir St. Gallen. They recently released their unused Bond theme and a new album is rumored to be imminent.